Welsh Cheddar is our youngest cheese, aged approximately 3 months. 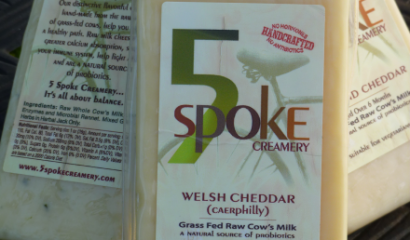 Like all of our cheeses, Welsh Cheddar is made from raw cow’s milk . The combination of spring milk and short ageing time result in a creamery, mild, buttery cheese. Todd Aarons, Executive Chef at Tierra Sur at Herzog Wine Cellars in California described Welsh Cheddar as” .. the true likeness of an English Somerset Country Caerphilly, with its rich raw butter smooth creamy texture…this cheese could help you Brits feel less homesick as you make a Welsh Rarebit sandwich”. We often describe the experience of unwrapping a block of Welsh Cheddar as reminiscent of prepping to bake; the rush of its buttery aroma is so strong. Welsh Cheddar is also an amazing melting cheese, gracing burgers at some of the finest gastro pubs and farm-to-table restaurants in New York and beyond.